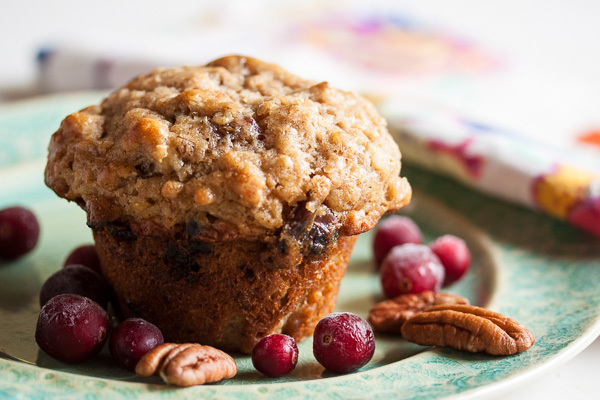 Oatmeal Muffins with Dates, Cranberries and Pecans | wanna come with? On the weekends, I’m likely to make myself a bowl of steel cut oats or splurge and make some french toast. But during the week, when I’m working, I like to just grab a coffee and a muffin. I usually have a supply of bran muffins in the freezer at the office so I can just pop one in the microwave in the morning. I love that bran muffin, but sometimes I just need to mix it up. 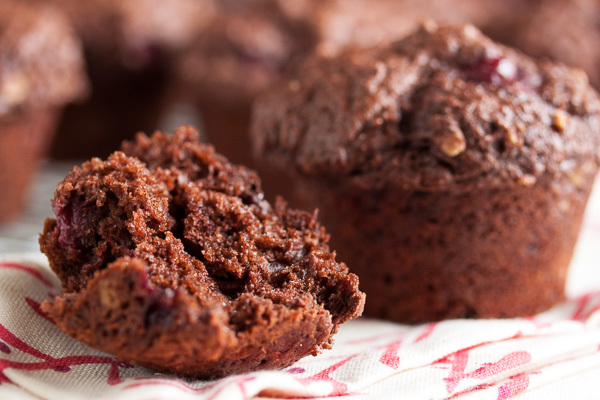 This muffin has been a welcome change – it feels like a real treat. Usually I’ll choose a recipe I want to make and will go shopping specifically to buy the necessary ingredients. But sometimes, I’ll be shopping and will just happen to see an ingredient that I want to make something with and will have to search for a recipe to use it in. Seeing some beautiful meyer lemons in the store one day led to lemon marshmallows. And seeing some gorgeous dates led to these muffins. I’m not a huge date fan – I don’t dislike them, but I won’t go out of my way for them. But these just looked so plump and sugary and delicious. My immediate thought was that they’d be great in an oatmeal muffin. I didn’t have an oatmeal muffin recipe that I really love, though, so I googled to see what I could find. And look at that, someone else had the same idea as me, and took it a couple steps further. Brown Eyed Baker is a genius. Dates and oatmeal already sounded good, but adding pecans and dried cranberries to the mix elevates a good flavour combination to something fantastic. 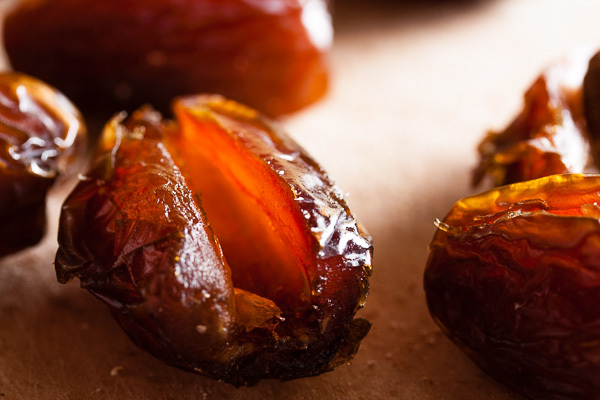 On their own, dates are quite sweet, but here they’re paired beautifully with the tartness of the cranberries and the nuttiness of the pecans. And the base muffin recipe is great. I’m pretty sure I’ll be returning to this recipe and playing around with some different inclusions. It’s not overly sweet, but has a lovely flavour from the brown sugar. 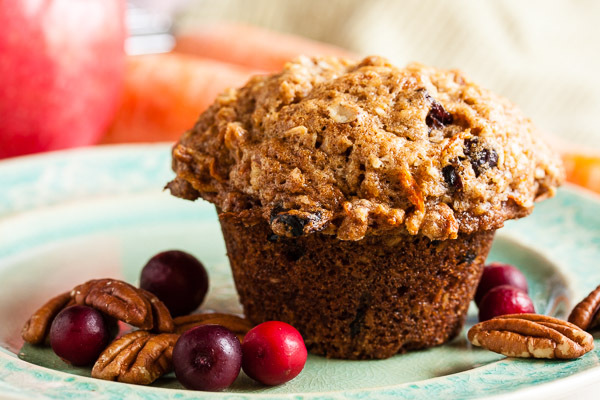 And a lot of oatmeal muffin recipes I’ve tried in the past are more like regular muffins with a bit of oatmeal added. Not this one. It’s loaded with oats. And it’s soooo moist and buttery. I may have found that perfect oatmeal muffin recipe I’ve been searching for. I’ve actually made this recipe twice. The first time I followed her recipe as-is, but the resulting muffins were quite small. So the second time around I doubled up and made some big café-sized muffins. Adapted from Brown Eyed Baker. I doubled the quantities to produce a larger muffin. If you'd prefer something smaller, feel free to cut all of the quantities by half. Preheat oven to 400°F. 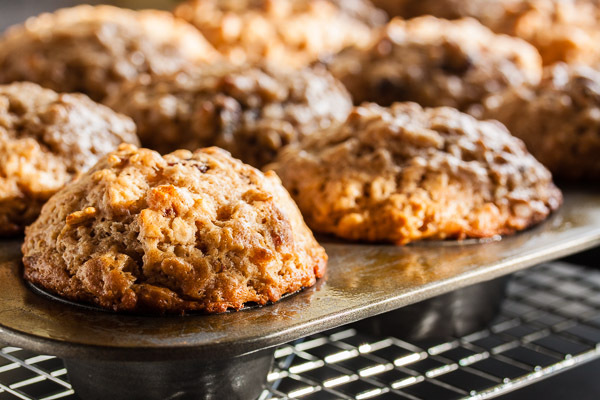 Lightly grease your muffin tin, both inside and along the top edge. I usually use a silicone pastry brush and a bit of vegetable shortening. It just takes a few seconds. 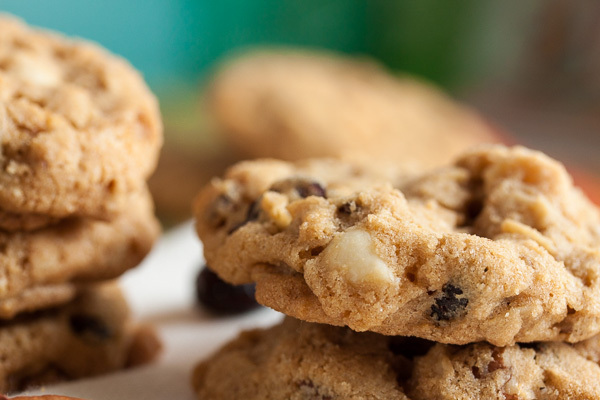 In a large mixing bowl, combine flour, oats, brown sugar, baking powder, baking soda, salt, and cinnamon. Whisk together well. I ended up using my fingers to break up any lumps of brown sugar. Stir in the chopped pecans, dates, and dried cranberries. Again, I ended up using my fingers to break up the pieces of dates that were sticking together. Once they're all coated with the flour mixture, they should no longer clump up. In another bowl or a large measuring cup, lightly beat the eggs. Add the butter, buttermilk, and vanilla, and whisk to combine. 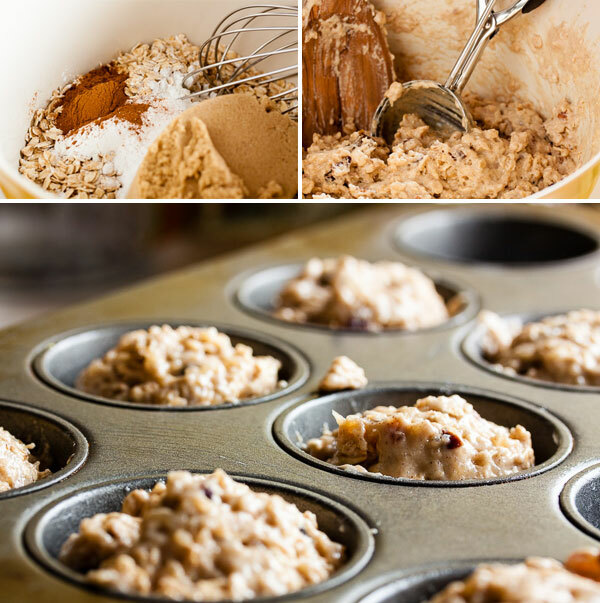 Using a large spoon or ice cream scoop, portion the batter into the muffin tin. Bake for about 15-20 minutes, rotating the pan halfway through, until a toothpick inserted in the centre of a muffin comes out clean. 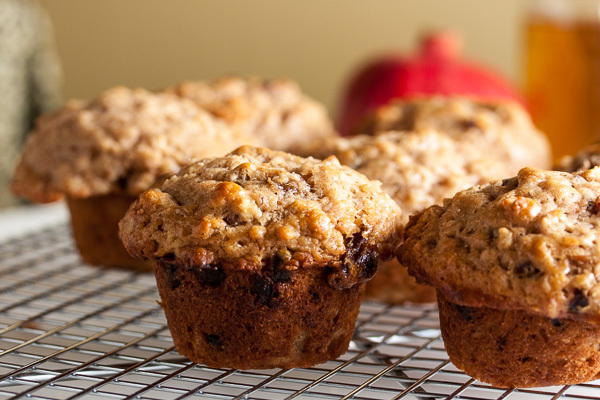 Allow to cool on a wire rack for about 5-10 minutes before removing from the muffin tin. 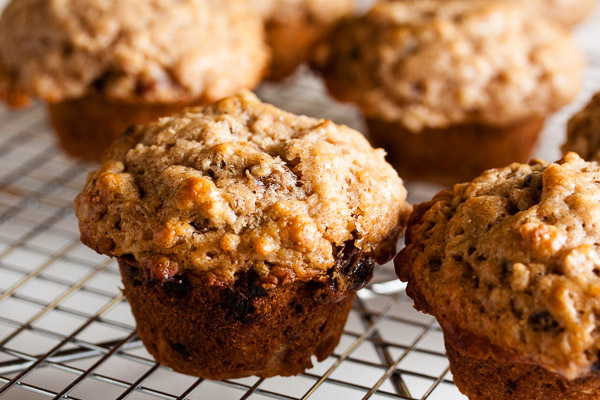 These look hearty for a nice breakfast! They are! I had them for breakfast at work for a couple weeks – fresh for the first few days, and then I froze the rest. I’ll definitely be making these again. These are fantastic! My batter was more runny, like cake batter, so I added two tablespoons of flour (we’re high altitude, so that’s pretty normal) still runny, but hey, it worked out great! I appreciate recipes with real ingredients like milk, eggs, and butter. Just eat them in healthy moderation and actually enjoy the food. Thank you! Thanks BD! And I agree with you regarding food made with real ingredients. I’d much rather have something like this than a mass-produced treat filled with preservatives and artificial flavours. Good thing I enjoy baking, eh? Love these muffins! I replaced the traditional oats with steel cut oats and soaked them in the wet ingredients while preparing the dry. Yum! Hi Nicole – that’s ok, I’ll take your cranberries LOL.